Oh dear, it has been a while, hasn't it? I have such a backlog of things I want to write about! 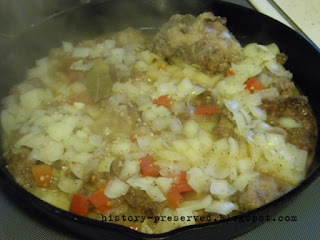 I'm glad this ration recipe was a great motivator to finally put up a post. Happy Autumn, by the way! My favorite season of the year - smoky, crisp mornings with a warm mug of tea, sweaters and bonfires, the smell of fallen leaves, pumpkins, cider, and apple butter! Aah! I've really longed for autumn and am so glad it's finally here! So, on to the recipe - It's an interesting one! 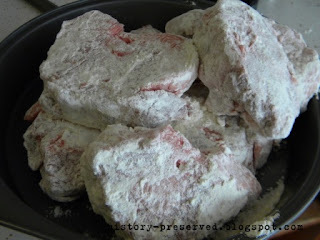 I found this recipe in my cookbook Coupon Cookery by Prudence Penny, published in 1943. It uses ox-joints or "ox-tail" which is essentially the tail of a cow. I know, kind of weird, but it's a viable source of protein! 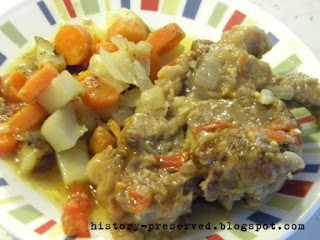 Ox-tail has actually been on my list to make for a while. 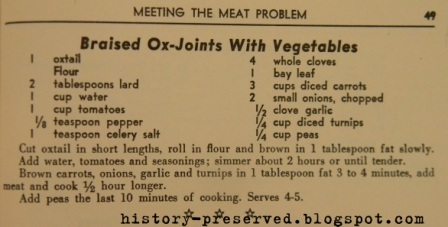 I've run across a number of ox-tail ration recipes, and it's one of those odd meat options from the war that we don't really eat today. I was excited to finally give it a try! Ox-tail is a bit difficult to find. Luckily, a local farm I like to go to now and then carries the odd meats like ox-tail, chicken feet, etc. I got it some time ago, and it's been sitting in my freezer every since. I just thawed it out, and was ready to go! 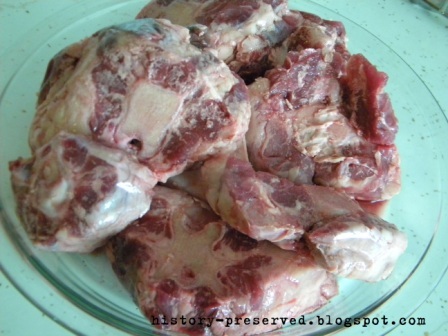 The things about ox-tail are that there isn't a lot of meat on them, there's a gigantic bone in the middle, and they have a lot of fat. They've got great flavor, though, and if you don't use them for eating, once they're roasted, they make a killer beef broth. It's worth getting them just for that. First step: breading the ox-joints. It's pretty straight-forward. Next step: Fry them up a bit in some lard. I used bacon fat, because that's what I had. I need to go get some lard! Next: Add the water, spices, and tomatoes and cook for 2 hours. I'll admit, I did not cook it that long. And I accidentally added the onions on top after letting them saute in a separate pan. It turned out this was a good accident. I think it's better to let the meat cook with the onions than without. 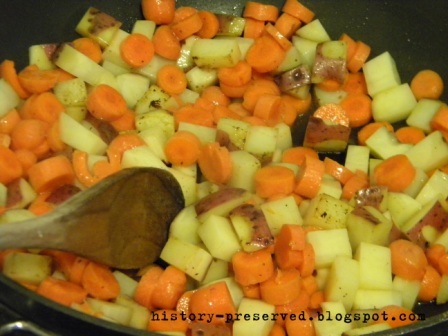 Then: cook the root veg separately. I didn't have turnip, so I used potato. It seemed odd to cook them this way. But in the end, it turned out to be a good thing too. I added the root veg on top and let it cook away with a lid on. I think maybe the whole thing cooked for about an hour. Maybe? It could have used some more time. I mean, the recipe says to cook it a whole 2 1/2 hours! Oh well. I didn't add peas in the last 10 minutes of cooking like the recipe called for either, but I think their green color would have been a nice addition. In the end, it was a very good thing I put the veg on top to cook. My cast iron skillet was entirely full on the bottom with the meat, so it kept the veg mostly out of all the fat that cooked out of the meat. Goodness gracious, there was a lot of it! I suppose that would have been good for the grease can for rendering later. 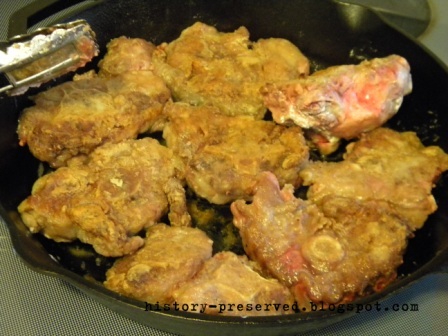 And "spare" meats like ox-tail weren't rationed, so you could eat as much as you could buy. I dished myself up some of this ox-tail and veg, and, boy, the flavor was awesome! The carrots and potatoes soaked up all that beefy goodness. The juices/fat were thicker, much like a gravy. The ox-tail itself tasted like beef. Go figure! But it was hard to find it among all the fat and bone. Overall, this recipe turned out much better than I could have hoped for. They knew what they were talking about! I was thinking, that this recipe could be modified to use a better-quality cut of bone-in beef, like part of a leg or something. It could be just as tasty, except you'd have more meat to find.